A farewell drinks party for my wonderful neighbours who are sadly relocating overseas sent me looking for a snack recipe that would taste great with wine, complement dips and antipasti and have a point of difference to the usual cheese offerings. Dietary considerations also demanded that it be meat and gluten free. The September edition of the Australian Gourmet Traveller, the French edition, featured a recipe for a baked cheese that jumped out at me. This is my interpretation of that recipe. 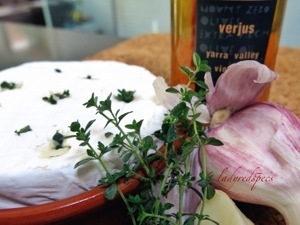 I chose a Tasmanian Camembert to team with young, soft new season’s garlic shoots, fresh lemon thyme from our garden and Mount Zero verjuice made from unripened and unfermented viognier grapes sourced from the Yarra Valley. My Spanish terracotta tapas dish was the perfect choice for both baking and serving the cheese. The aroma of the cheese fresh from the oven was enticing. I took my warm cheese to the party on a basket with commercial gluten free crackers. If a successful dish can be measured by leftovers then my warm baked cheese was a winner. My assessment: next time I’ll be much more generous with the garlic and thyme. Lightly oil a small ovenproof dish that will fit the cheese snugly. Scatter the sliced garlic shoot over the base of the dish. Place the cheese in the dish then pierce the rind cross shaped with the point of a sharp knife 5-6 times. Finely slice the garlic clove, then poke a sliver of garlic and a small sprig of thyme into each slit. Spoon the verjuice over the cheese, then scatter the surface with thyme and black pepper. Bake for 15 minutes. Cool slightly before serving. It is very sad, borderline heartbreaking, when good friends move away. 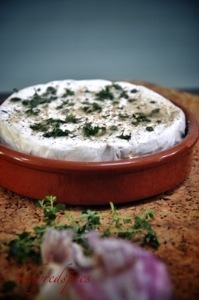 Your choice of warm, soft, fragrant Camembert sounds like a wonderfully delicious and comforting choice! Thanks, the Camembert was a great success. Yes I’ll miss my friends a lot!!!!!! Thanks, it was gooey good! Thanks. Australian cheese tastes great! With our weather turning colder, I love to pull out the warm cheeses for appetizers when having friends for dinner. The aroma’s inviting and they are quick to disappear. This will be a new one to serve. Thanks. I hope you enjoy the Camembert when you make it, we did! – I love cheese, but rarely, if ever, prepare them at home. My Iranian side grew up on feta only, and Japanese have no cheese in their authentic cuisine. Bottom line, my knowledge on cheese is very limited. I only use them if they are called in the recipe and exactly what the recipe specifies. Having said that, I love cheese and I eat them with pleasure when I am served. Posts/recipes like this teach me names of cheese and how they are served, so elegantly as you have. – What is the purpose of spreading verjuice on the top? Is it only for flavor enhancing or it has other purpose? The Camembert is an mild oozy cheese contained within a white mould rind. The verjuice keeps the rind soft while the cheese warms through and adds just a touch of acidity to balance the creaminess. It’s been a lot of work coming home after 3 months, catching up with family and friends, tidying up the garden, attending to a mountain of mail and restating our house to normality after depersonalising it for our house/ dog sitters. Finally I’m getting on top of it, but now I need a holiday! Sandra, you have now hit me where I live. I love cheese of all kinds. Periodically, we do at home picnics with cheese wine and fresh fruits. My mouth is watering from the photo. Looks and sounds wonderful. Me too and no day passes without cheese of some sort. We have wonderful artisan cheese makers in Australia, making traditional European style cheese from cows, sheep, goat and buffalo milk. I generally prefer my cheese not be be messed about with too much, but this was a definite crowd pleaser, and I loved it too. Give it a try and let me know what you think. You’re so kind Lidia! It would be wonderful to have a foodie neighbour like you! Lovely! I also like the presentation…Very nice! I’d love to lay my hands on some of that verjuice! It’s a wonderful ingredient to cut through richness, it’s flavour note akin to tart apple juice. Yum, yum. Looks great and would have gone so well with the other offerings. 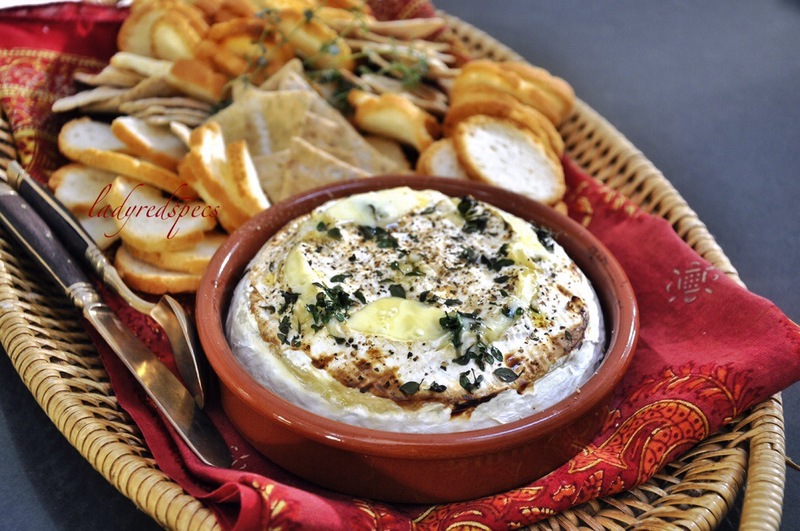 This entry was posted on October 10, 2013 by ladyredspecs in FODMAP diet, Food, Gluten Free, Light Savoury Dishes, Side Dishes & Salads, Vegetarian and tagged camembert, garlic, lemon thyme, verjuice.